What Can You Clean With PowerStroke PS14133? PowerStroke Tools is a well-known company dedicated to making a variety of power tools. They specialize in outdoor power equipment and they strive to deliver durable machines for their customer’s needs. Their pressure washers are powered by Yamaha or Subaru motors which have a good reputation in the community. We have prepared an unbiased PowerStroke PS14133 review because it is an economical light-duty residential model that offers enough power for residential cleaning tasks. We will test the machine and share our view on the pros, cons, and other useful information about the unit. 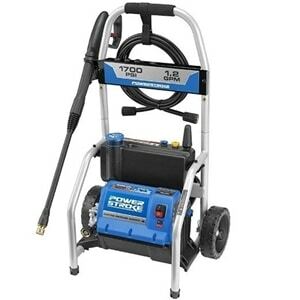 The PowerStroke PS14133 pressure washer comes with a 13amp electric motor situated on a durable frame with a roll-cage design. It is very compact and easy to store away. The unit provides 1700 PSI at 1.2 GPM which totals to a cleaning power score of 2040. We tested the model according to its user manual on various surfaces and have to say the following: don’t let the low PSI fool you, this pressure washer can handle a lot of dirt. It also weighs around 32.4 pounds, making it a fairly light model in its performance range. PowerSroke tools used its roll-cage design to give the whole unit stability and increased protection. The blue, black and silver coloring also makes it pleasant to look at. The frame also features an integrated hose reel for easy hose storage. There is also a place for your nozzle attachments located on the onboard 1-gallon detergent tank. With a tank that size, you will never have to worry about carrying around a bucket of soap. The PS14133 also comes with a 20-foot high-pressure hose and about 15 feet of power cord that does allow you to cover a lot of areas but you may need an extension cord. The machine comes with a set of 3 different nozzles to tackle various cleaning jobs. The turbo nozzle is perfect for your in-depth cleanings like sidewalks and driveways. The 15-degree nozzle is slightly less powerful but it still produces a focused stream you can use on decks, fences, and siding – especially if you have a hard stain. Lastly, the soap nozzle is low in pressure and used mostly for applying cleaning chemicals and washing sensitive surfaces like windows. The PowerStroke Tools company has worked on creating a dependable relationship between its customers and the brand. If the unit stops working, you are advised to contact the company and not the retailer who sold you the pressure washer. The PowerStroke PS14133 was designed to get rid of stains, dirt, and grime from virtually any surface. The little unit can, in fact, handle wooden, cement or open brick surfaces, restoring their previous shine and cleanliness. Also, you can use it freely on house windows, cars, masonry, and patio/garden furniture. However, since this is a residential model, it wouldn’t be advisable to use the PowerStroke PS14133 for a prolonged period of time – the smaller units were not designed to endure everyday use. The manufacturer classifies this unit as a light-duty pressure washer. It is small, compact, portable and durable. It can quickly handle all light cleaning jobs and even clear the build-up on your patio or outdoor decks created by bad weather. This pressure washer is very budget-friendly. You can store all of the attachments and equipment on the pressure washer itself. The warranty doesn’t cover any of the attachments or accessories, unlike other portable pressure washer manufacturers. The power cord is only about 15 feet long. For a light-duty pressure washer, the PowerStroke PS14133 can handle a lot of dirt and grime. The lightweight design gives good protection to the unit and fine mobility. The nozzles offer a variety of solutions for your light cleaning jobs. It is fairly easy to assemble and use. If you are looking for a compact machine that can handle cleaning your home, garden, garage, and vehicles, you’ve found it. This model is a good investment for the cleaning power it offers, compared to its price. We hope we have touched upon all of the important points in our PowerStroke PS14133 review. If we missed something, please feel free to write your questions below in our comments section and will get back to you as soon as we can.